The thought of quitting dieting can be a really scary one. After all, many of us have been doing some sort of diet (or ‘healthy lifestyle’ if that language is more familiar to you) to either lose weight or keep our weight ‘in check’ for most of our lives. And yes, I really do mean most of our lives given the fact that more than half of Australian primary school children have the desire to lose weight. It makes sense then that we can find a whole range of reasons as to why we believe we can’t, or shouldn’t, be quitting dieting. Because it feels safer and comfortable inside our diet bubbles. But after pondering some of the common reasons people don’t want to quit dieting (or feel like they shouldn’t or can’t is probably more accurate), I think the majority of them are actually myths. The problem with believing these myths to be facts might be holding you back from food freedom and body peace. why do I want food freedom and body peace anyway? OK, I want you to get honest with yourself here for a minute. This is just between you and your computer screen. If you have ever tried to lose weight or control your weight or believe the status of your health is tied to your weight, I invite you to take a pause and think about how that experience has been for you. Has the weight has fallen off and never come back again? Have you been able to eat whatever you like (TRULY whatever you like)? Have you never experienced feeling deprived of food or looked longingly at people ‘who get to eat whatever they like’? Or, has it been a struggle? Have you felt you have been constantly at battle with your body? And at war with your mind as it keeps obsessing over the food you can’t eat, or that fact that you are always hungry? Maybe you were doing it to lower your blood pressure or your blood glucose levels and losing some weight hasn’t made a difference (or maybe it has made those measurements worse). So, you feel scared that you are going to have to be even stricter with your diet and exercise so that you don’t develop diabetes, or cancer or heart disease? NOT having to live and think this way is the reason why you want food freedom and body peace. And the first step to this freedom and peace is quitting dieting. So, let’s bust some of those myths, so you can let go of some of those roadblocks holding you back. There is a very real belief and fear, that quitting dieting – in whatever form that may look like – will cause you to let yourself go. But dieting or pursuing weight loss is our current default position. Everyone does it. Health professionals suggest it as the solution to all illnesses and health problems. It is the expected course of action in the New Year, or after a woman has had a baby. Dieting is the norm. So, quitting dieting in our thin-obsessed culture is actually a radical action. And it is anything but passive. 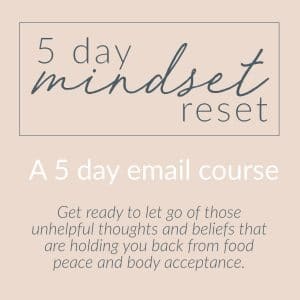 Letting go of the diet mindset and embracing a weight-neutral approach to health involves a lot of work – mentally, emotionally and physically. It is often thought that quitting dieting and letting yourself go will cause you to eat nothing but chocolate, biscuits and ice cream. I can totally see why that might be the case. It is logical to think that the opposite of controlling our food through portion sizes, rules about good and bad foods, rules about when to eat, foods that are allowed in the house, foods that are banned etc. is eating ‘junk food’ uncontrollably for the rest of our lives. This is black and white, rigid thinking. It is not health promoting and is also not true. 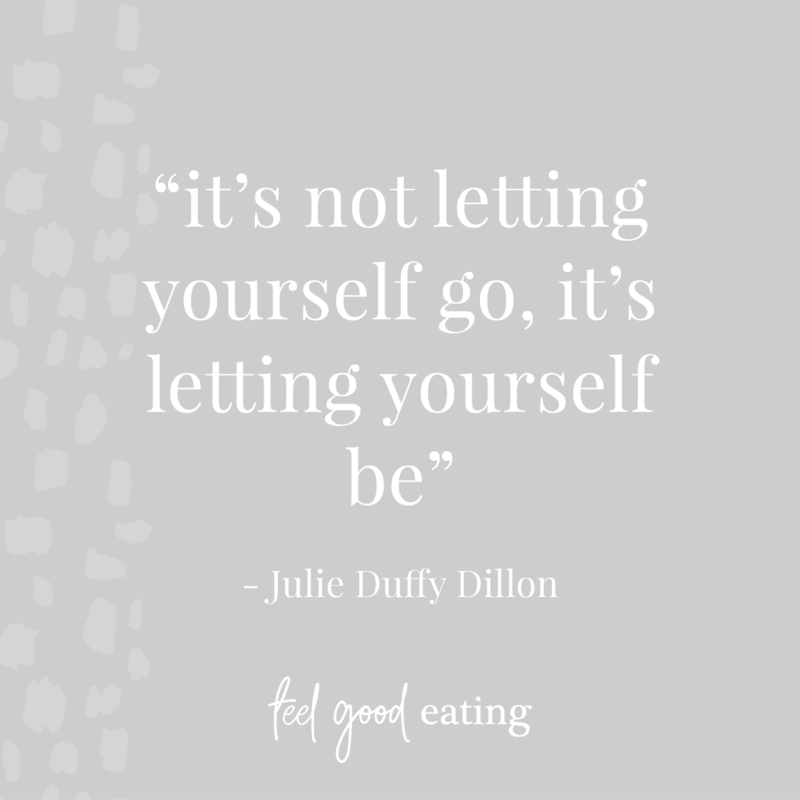 Yes, a lot of people find that when they quit dieting and loosen their grip on their food rules, they initially feel like they are eating ALL THE FOOD, ALL THE TIME. But that is just our inner diet rebel seeking some relief from all of that food restriction! 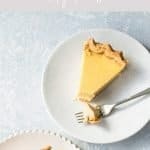 Over time, however, that rebellion or ‘honeymoon phase’ subsides and makes way for us to become more intuitive eaters. It is almost like a rite of passage towards becoming an intuitive eater. And this is the one myth where I see the greatest transformations within my clients. They always express amazement to me that when they start listening to their bodies rather than their diet rules, that they find they are craving vegetables or salads with their steak rather than hot chips, or feel satisfied eating couple of chocolate biscuits rather than the whole packet. Or they realise they don’t actually LIKE chocolate biscuits! Most importantly, they realise that restriction and food control is a surefire way to end up overeating or in a binge later on. This is because they have learnt from experience what makes their body feel good and know that taking care of their body doesn’t mean eating a perfect diet 100% of the time. And they don’t feel the need to be controlling their weight. If quitting dieting means letting yourself go and existing on a diet of ‘junk food’, then it is reasonable to expect that these behaviours will lead to poor health, right? Nope, this is another big myth. You would need to scroll through tonnes of links to journal articles if I were to list each and every piece of scientific evidence that has been published showing that dieting, dieting behaviours and the diet mentality are DAMAGING TO HEALTH. They may cause some temporary weight loss initially, but overall, they don’t lead to long-term improved health. Instead, they cause poorer mental and emotional health, stigmatise people in larger bodies, increase the risk of developing disordered eating or an actual eating disorder like Anorexia Nervosa or Binge Eating Disorder and can make people less physically healthy due to the stress weight cycling puts on the body. 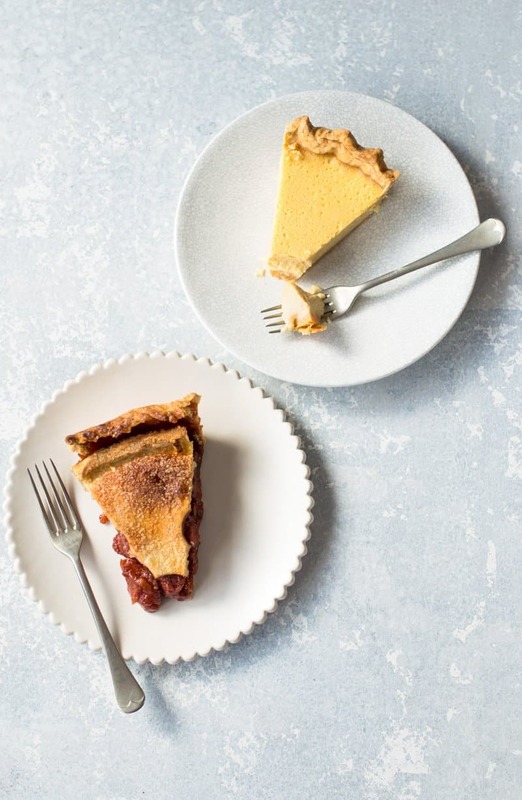 On the flip side, quitting dieting, embracing Health at Every Size® and a taking non-diet approach to health has been found to IMPROVE health markers such as blood pressure, blood glucose levels and mental health regardless of what someone’s weight is. These are the health markers that correlate more accurately with a person’s risk of developing heart disease or Type 2 diabetes – not weight. So, you might find that quitting dieting is just the thing you were looking for to move you towards health. 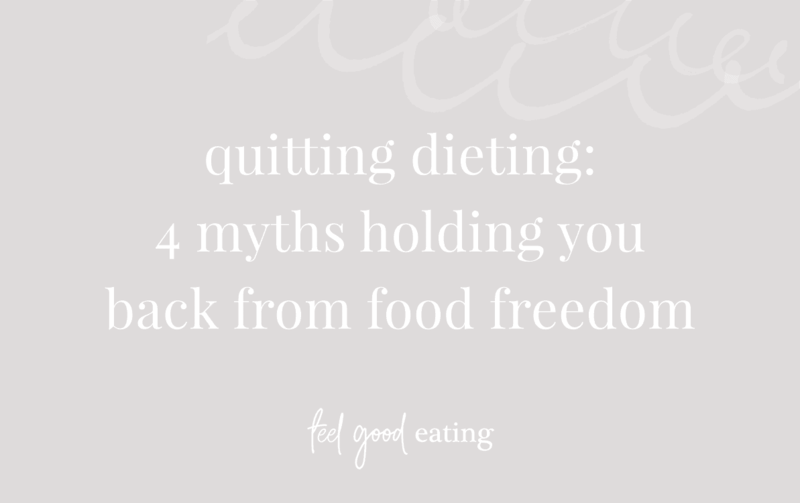 I have been saving the biggest and ‘baddest’ myth holding people back from quitting dieting ‘til last! To be honest, maybe you will gain weight after quitting dieting. But maybe you won’t. The point is, no-one (not even those people who guarantee you will lose weight following their 12-week program) has a crystal ball and can gaze into the future and predict how your weight and shape will change. But what IS a fact backed by science is that the pursuit of weight loss through dieting behaviours, in the majority of cases, causes people to re-gain weight and often gain more weight on top of that. Science has shown us, that there is not one diet or ‘lifestyle change’ out there that can generate sustainable weight loss. NOT. ONE. 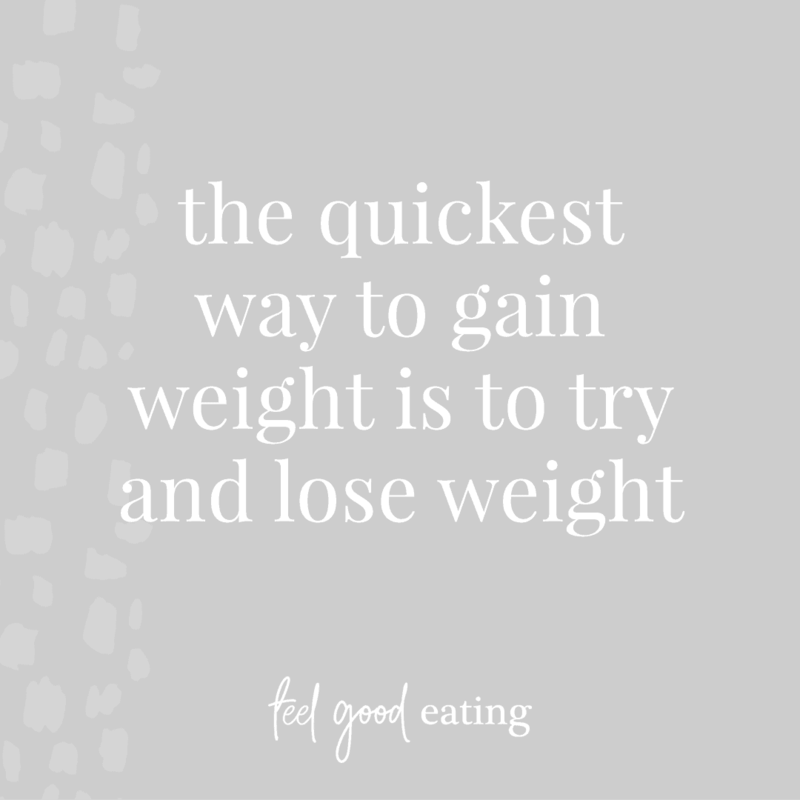 That is why there is a saying that goes along the lines of: “The quickest way to gain weight is to try and lose weight”. I hope this has helped to dispel some of the common reasons why people don’t want to quit dieting as myths rather than legit reasons to keep pursuing weight loss. what is holding you back from food freedom? Obesity (Silver Spring). 2017 Feb;25(2):317-322. doi: 10.1002/oby.21716. Obes Rev.2015 Feb;16 Suppl 1:7-18. doi: 10.1111/obr.12251. Appl Physiol Nutr Metab.2007 Feb;32(1):125-42. You are definitely meant to as you get older! These are wonderful tips for starting a GREAT relationship with food 🙂 Thanks for sharing!! This is great and more people need to hear it! You are right though, dieting is not the answer, but just because you are not dieting does not mean that you can’t eat healthy. Dieting is for sure damaging in so many ways. Agreed! Where ‘healthy eating’ is being done to control weight, it definitely can be damaging. Excellent post! Cheers to no -diet dietitians!! Raising a glass with you Kelly!